The name shabu-shabu imitates the sound you make as you gently swish your chopstick-held morsels of raw meat in the steaming broth. Meat cooks quickly in boiling water, and these paper-thin slices are done in a few seconds, so the secret is not to lose them in the broth. Vegetable ingredients, however, usually take a little longer time, so they are cooked according to the "drop-and-retrieve" method used in most other nabemono dishes. Make the sauces and spicy condiments listed below and let each diner mix them at will in his own dipping bowl. This is part of the fun of eating shabu-shabu - everyone can create the flavor(s) he desires. The sauces - citron-based ponzu sauce and one based on toasted ground white sesame seeds - are used separately. The spicy condiments complement either sauce. Start the meal with an appetizer, then proceed to the shabu-shabu with the flameproof casserole set on a heating unit on the table. Just as fish is cooked first in fish one-pot to develop the flavor of the broth, in this dish, start with the meat. When all the meat and vegetables are finished, you may drink the broth, lightly salted, from cups. Noodles may be added to the broth in the casserole and served in hot broth to each diner. With this dish Japanese drink hot sake, cold beer, or hot green tea. If you want to drink wine, choose a dry red. For dessert, offer everyone a choice piece of fruit or a simple sherbet or ice. In Japan, shabu-shabu is a great party dish, served at home on real occasions, in part because the high-quality beef required is expensive. But, East and West, this dish is a treat that guests will long remember. Serve in a donabe casserole or a Mongolian hot-pot. Meat: Buy sirloin for beef shabu-shabu, or lamb loin rib. In either case, the meat should be well marbled, so it will be tender when cooked in boiling water. Have your butcher cut the meat into paper-thin slices, thinner even than sukiyaki slices. This might be difficult to do at home, even with frozen meat. You may have to cut each slice in half crosswise, depending on size. Individual slices should measure about 8x3 inches (20x8 cm). This makes a convenient one-bite size. Do not simmer slices so large that they are unwieldy as cooked morsels. Shiitake mushrooms: Notch decorative crosses into the caps. If extremely large, cut caps in half. Long onions (or green onions): Cut diagonally into 1 1/2-inch (4cm) lengths. Chinese cabbage: Trim bottom of a Chinese cabbage and separate 6 whole leaves. (Use rest of head in another recipe.) Wash, then parboil whole leaves till tender, about 2-4 minutes, in ample water in a large pot. Drain, salt lightly, and pat dry. Using a bamboo mat, roll cabbage leaves (optional), and cut into rounds, or just use leaves without rolling. Edible chrysanthemum leaves: If sprigs are extremely long, cut in half for easier handling when cooking. Tofu: Cut tofu into 1 1/2-inch (4cm) squares when platter is arranged. Wheat gluten (fu): Soak for about 5 minutes in tepid water. Squeeze out moisture and use. Bamboo shoot: If using canned bamboo, wash thoroughly (remove bitter, limelike deposit between interior ridges), parboil, and cut into half-moon slices about 1/4 inch (7.5mm) thick. Prepare sauces and spicy condiments. Both sauces will keep refrigerated for 2 or 3 days, so they can be prepared well in advance, but they are best prepared just before serving. The green onion can be chopped a few hours ahead of time and refrigerated, but the grated white radish must be prepared immediately before serving. To arrange the platters: Arrange some of all ingredients on 18-inch (45cm) round platters in the spirit of munificence that this dish deserves. Arrange the slices of meat attractively so that each slice can be easily picked up with chopsticks or fondue fork; a clump or wad of slices is unappetizing, and slices are difficult to extricate from such a tangle. Arrange vegetables on a second platter in the same way, or arrange one for meat only and one for vegetables only. It takes 5 minutes to arrange the platter if all ingredients have been prepared. Bring just to a boil, remove kelp just before boiling point is reached, then simmer gently for 3 to 4 minutes. Do this either on the kitchen stove, transferring the pot to the heating unit on the table at the last minute, or on the table heating unit itself. Each diner should have chopsticks or a fondue fork. Since there are two dips, you should have two dipping bowls available for each diner. (Chances are, however, that only one will be used.) Either spicy condiment is mixed into ponzu sauce to taste, but finely chopped green onion only is added to sesame sauce. Each diner picks up a piece of meat from the serving platter and swishes it to and fro, shabu-shabuing, in the simmering broth till the red meat becomes pink. Rarer meat is also delicious. Diners may alternate between meat and vegetables. Occasionally skim the broth to keep it clear of foam. When meat and vegetables have been finished, ladle the broth into bowls and serve lightly salted with a bit of chopped onion. In a dry, heavy frying pan, toast or parch the white sesame seeds over medium heat till golden brown. They burn easily, so keep the seeds moving by shaking the pan, also using a dry spoon to stir the seeds occasionally as they brown. Be careful: the time difference between golden brown and burnt is not very great! Transfer warm toasted seeds to a suribachi (Japanese grinding bowl) and grind with pestle till flaky. Add the remaining ingredients, and dilute with dashi (either chilled or room temperature), mixing well between additions. Use a rubber spatula to blend and smooth sauce. May be stored in a tightly sealed container in the refrigerator for up to 3 days, but best when just made. Stir before serving, in case some of the sesame has settled to the bottom. Mix all ingredients and let stand 24 hours. Strain through cheesecloth and mature 3 months in a cool dark place, or refrigerate. Keeps indefinitely, but should be used within 1 year for best flavor. Easily the most comprehensive and exhaustive look at Japanese cuisine available, this groundbreaking classic marks its quarter-century anniversary in a revised edition with a new foreword by Gourmet editor-in-chief Ruth Reichl and a new preface by the late Tsuji's son, Yoshiki Tsuji. Part cookbook, part philosophical treatise, this highly acclaimed collection offers a wealth of insight for amateurs and experts alike. 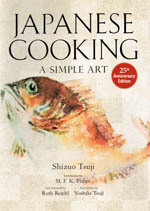 Every technique associated with Japanese food is described step by step in great detail, along with illustrations to guide the reader through everything from filleting fish or cleaning an octopus to rolling omelets. Sections on the Japanese meal, ingredients and selecting and cutting fish, chicken and vegetables offer great insight into the culture as well as the food. The recipe section of the book is divided by cooking method rather than food type, including grilled and pan-fried, steamed, simmered and deep-fried. Dishes range from the simple, Pan-Broiled Salmon, to the more complex, Nagasaki-Style Braised Pork, and many dishes are vegetarian. Sushi and sashimi are covered in depth, as are knives, the proper way to slice the fish, and decorative presentations. A complete guide to Japanese cooking, this collection is must-have for anyone interested in Japanese food or culture. Or use the ISBN to order from your local bookstore. Copyright (c) 1980 by Shizuo Tsuji Reprinted by permission. All rights reserved.